• e-Training (on-line self-paced training environment). • All forms aligned to ADE developed/provided EL forms. • ELP Standards integrated into Individual Language Learner Plans (ILLP). • All EL student data managed in a central location. • Notification of due dates, such as meetings and ILLP review due dates. • Provides for documenting individual language data and eligibility for each EL student. • Allows for tracking of the receipt of all paperwork generated for each EL student. • Document locking feature allowing EL teams to lock down documents to protect data integrity. • Assists in resolving any outstanding EL Corrective Action Plans. • Special education student data from the e-IEP PRO is automatically linked into the e-ELL PRO. • Tracking information for placement and funding is available for all EL students. 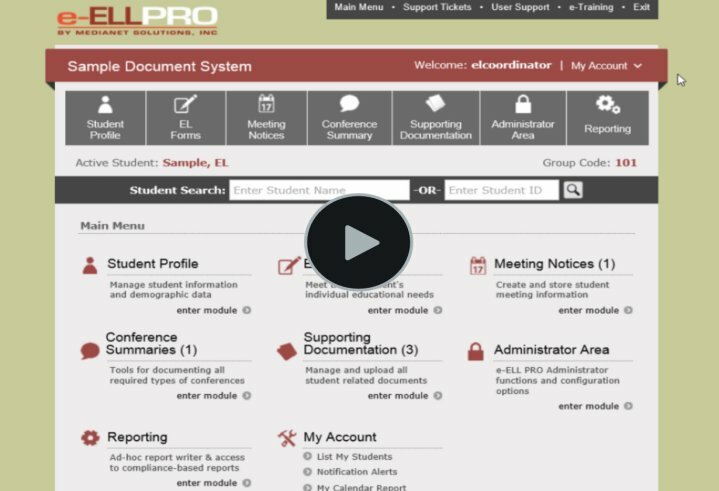 To learn more about these features and benefits, please view the videos to the right and/or select the link below to view/print the e-ELL PRO Marketing slipsheet. Please click on the images below to watch the recorded e-ELL PRO Slides Presentation and/or e-ELL PRO Software Demonstration video. If you have any questions or would like further information, please review different sections of this website or contact us.